What have we been doing with our spare time you ask? Between planning our next holiday vacation to Malaysia, we have enjoyed a number of weekends golfing, fishing and general site seeing and touring in South Australia. For example, we spent one weekend bicycling in the Clare Valley which is approximately a one hour drive from our home away from home. 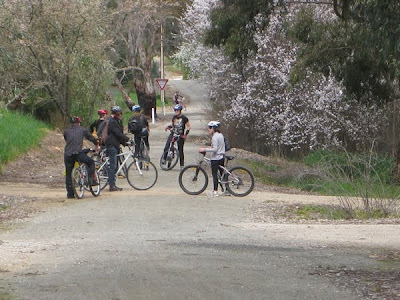 In our view, cycling in the Clare Valley must be similar (or better?) 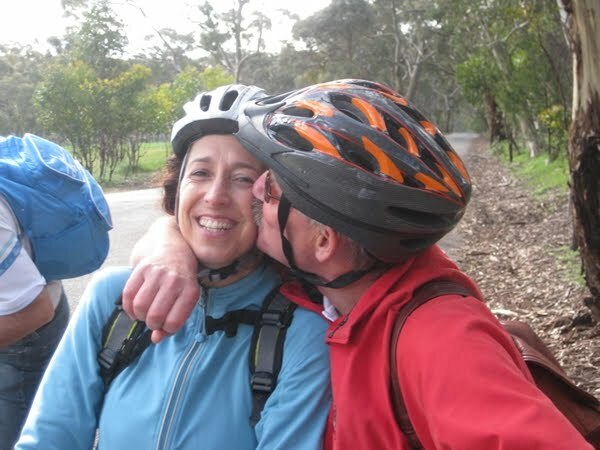 to biking in Italy’s Tuscany region or the Bordeaux in France. The Clare Regional Tourist Board has transformed an old railway bed in the valley into a biking trail that just happens to conveniently intersect a number of vineyards and wine cellars. Say no more as you can imagine the number of holiday seekers pleasantly cycling a graded rail bed without any traffic worries. On a beautiful spring day, what better way to pass the time than by getting plenty of exercise while at the same time stopping for a needed rest and letting your palate savour that magic elixir referred to as the “Nectar of the Gods”. The Clare Valley Rieslings are world renown but you won’t be disappointed with a red either. On October 16th we have promised our Australian friends that we will host a traditional Canadian Thanksgiving Dinner. They have indicated to us that they are very excited about this prospect since they have witnessed many Thanksgiving Dinners in movies, but sadly do not celebrate the thankful time of harvest. So this will be their first Thanksgiving feast! What started out as a dinner party for five people has quickly expanded into a festive party of more than twenty! We suspect that we may write a separate blog entry to describe the much anticipated mirth and merriment. 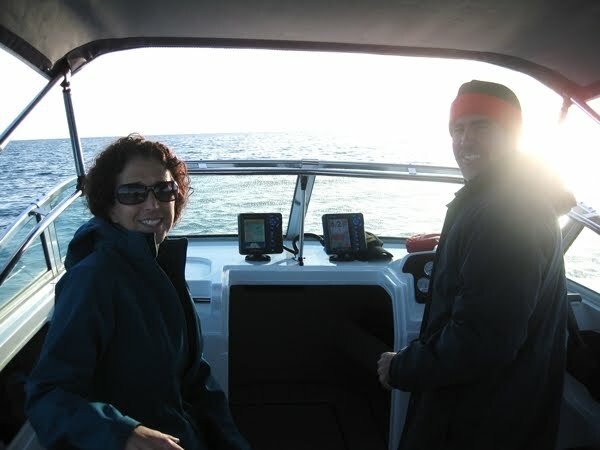 Coastal fishing in South Australia is a leisurely past time enjoyed by many. The Yorke Peninsula is bounded to the east by the Gulf of St. Vincent and to the west by Spencer’s Gulf. Consequently, the peninsula is a destination spot for the avid fisherman. On weekends, it is not unusual for the local highways to be full of vehicles pulling trailers laden down with a boat. We have been most fortunate to be able to go out a number of times into Spencer’s Gulf with Andrew, one of Gail’s teaching colleagues. 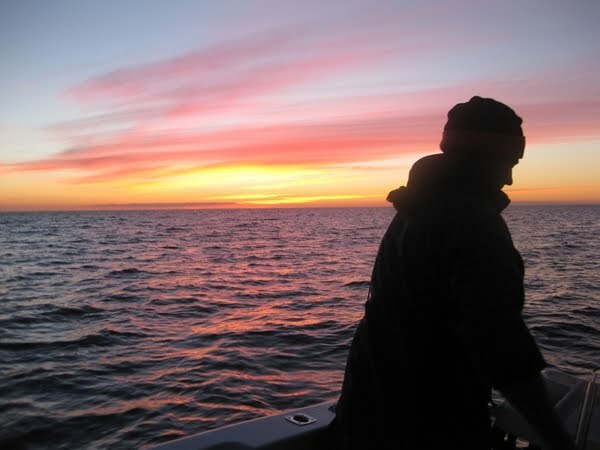 Andrew’s idea of an excellent time is to get into his boat after work on a Friday evening, go out to a number of his “special fishing spots”, and catch his limit while the sun slowly slips below the horizon. 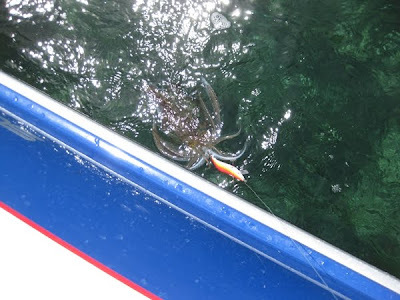 Squid, Snapper, Prawns, King George Whiting, Blue Crabs and Garfish are only a few of the ocean’s treasures that can be caught and freshly delivered to the dinner table within a couple of hours time. 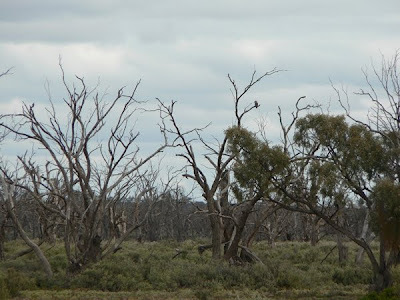 Needless to say, the experience is unforgettable and one of the main reasons why some people love to live in Kadina. For both of us, golfing in South Australia has been rustic and disappointing, yet at the same time charming. We need no convincing to realize that we have been very spoiled when it comes to golfing in Edmonton. Why has golfing been disappointing? To be fair, the reason for our disappointment in golfing only pertains to public courses; as we have not had the opportunity to play any private courses. Prior to arriving in South Australia, we foolishly had false expectations that the golfing would be incredible. After all, we were going to the Land Down Under where you can golf 12 months of the year. 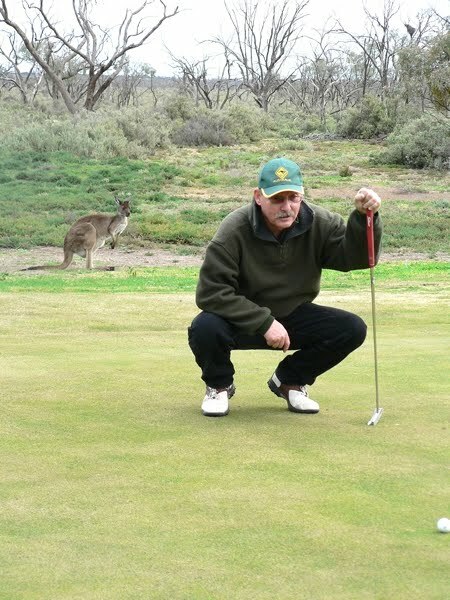 Many pros on the PGA circuit are from Australia, so golfing must be a major sport with plenty of first class courses! This expectation is certainly true for some areas of Australia such as Queensland, but it indubitably doesn’t apply to the public courses in South Australia. 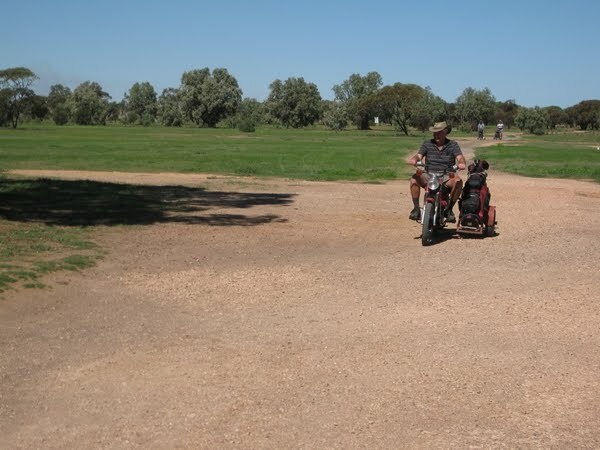 Because of the absence of water sources, the nearest golf course to Kadina that has grass greens is located approximately one hour away. 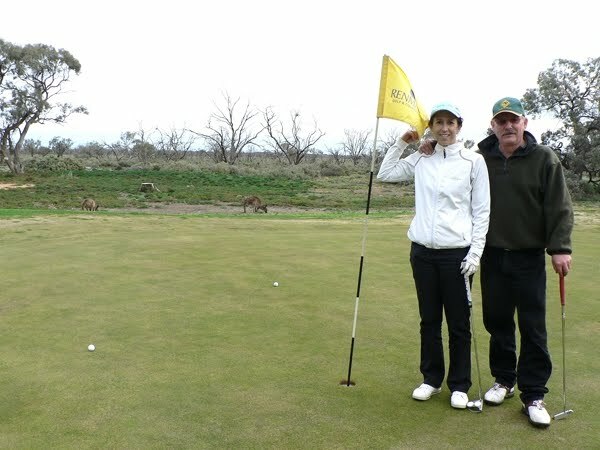 In and around Kadina, the golf courses have greens that are made of a sand–bitumen mix which are called scrapes. They are referred to as scrapes because you rake or “scrape” the sand-bitumen mix prior to putting. Because of the drought conditions that South Australia has been recently exposed to in the last few years, conditions on the golf courses, whether they be grass greens or scrapes, have been marginal. Hence the disappointment. 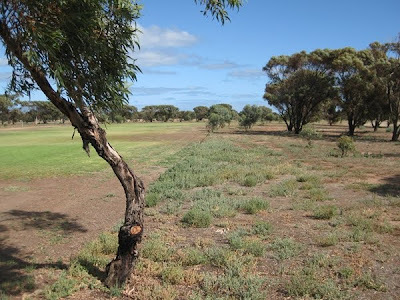 However, we only have ourselves to disparage as we arrived in South Australia with pre-conceived expectations that the golfing would be fantastic. Why has the golf been rustic? Firstly, the marginal condition of the courses provides you with the feeling that you are playing on a rustic course that is in need of TLC (tender loving care). Even many of the resort courses need some TLC; no doubt primarily due to the absence of much needed water. Secondly, most of the country courses are maintained on a volunteer basis, so course grooming does not even come close to what one would see or expect at any of the courses around Edmonton. Why has the golfing been charming? Once you get your head past the disappointment and rustic feeling while on the course; you find the golf to be rather charming. For example, all the country courses are played on the honour system. You simply place your green fees into an envelope and deposit the envelope into a locked box located at the club house. Green fees for scrapes typically range between $5.00 and $10.00 while grass greens at a country course may cost as much as $20.00. On non competition days, you will be lucky if you share the course with two or three other foursomes. It is quite charming to know that you have the entire course to yourself and it only cost you a pittance when compared to Edmonton area prices. We realize that we shouldn’t be so harsh on criticizing the condition of the courses given the cost of play. After all, you get what you pay for. It’s just that there are no other choices. Sorry if we are sounding like spoiled brats! Excuse us as we help ourselves to a little more cheese with our whine. You may find it hard to believe after our complaining about golf course conditions, but our golf experience this year has been enriching. The real charm has been the joy of taking in all the different sights and sounds that would be foreign to us in Edmonton. For example, many of the locals have converted 50cc motorcycles into golf carts. On competition day, it really has been a treat watching some of the old guys motoring down the fairway chasing after their ball. Some don’t even bother to turn off their motorcycles while they take the next hit of their ball. It has also been a surreal experience to hear the haunting laugh of a Kookaburra cry in your ear as you are in the middle of your back swing. Or watch a Kangaroo watch you while you study your putt on the green. 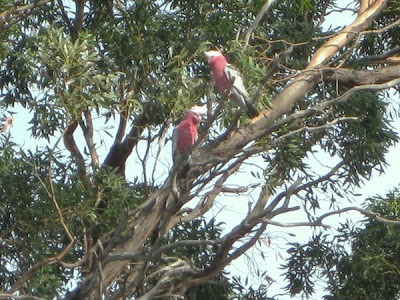 Or just observe the many species of Parrots preening in a tree next to you while they show off their full plumage of pinks, greens, and reds. Oh, did we forget to mention the snakes? One of the first things that the locals teach you is to make sure that you always push your golf cart in front of you rather than pull it. That way the snake has time to move out of the way before you get there. Also, if you happen to venture into the rough, always take out your trusty 3 iron for protection and make sure that you make lots of noise. We have been told, although we find it hard to believe, that the snakes are more afraid of you than you are of them. Needless to say, we have left a few balls in the rough rather than venture into snake territory.